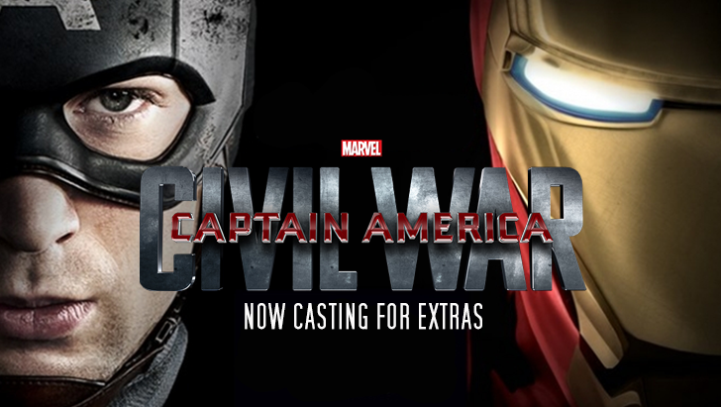 Captain America: Civil War is ramping up production in Atlanta, and casting calls for featured roles are ongoing. The new Captain America movie follows the 2011 Captain America: The First Avenger and the 2014 Captain America: The Winter Soldier. It is centered on the events after the Age of Ultron, where the collective governments of the world create an act that is designed to control all superhuman activities. This will cause conflict between the Avengers, with some agreeing with Iron Man and others with Captain America. Eventually, an epic battle ignites between former allies. Chris Evans will reprise the role Captain America. Robert Downey Jr., Scarlett Johansson, Chadwick Boseman, Anthony Mackie, Frank Grillo, and Sebastian Stan will also be in the cast. While they are looking for male and female talents of all ages to be cast for hundreds of background, supporting, and stand-in roles, there are some which are required specifically. Twenty-one-to-fifty-year-old ex-military men or those with weapons/tactical training are sought to work on upcoming scenes from June to July, while female stand-ins are also wanted. However, you must be 5′ 2” – 5′ 9” tall and between the ages of 20– 25 years to fit for the roles. Also, they are looking for 35-to-75-year-old politician types of any ethnicity to play as senators, congressmen, and congresswomen. Talents of 21– 40 years old are needed for the parts of congressional aides and assistants. They also want to cast men and women to depict reporters and photographers. Experience is preferred, but not a must. Former and current police officers with military training. Although, those without an experience are still welcome to apply. Thirty-five-to-seventy-year old actors and actresses are required to portray college professors, and 18-to-30-year-old talents to act as college students. You will be in scenes which are to be shot from June 14 – July 4. Submissions will only be accepted until July 3, 2015. Seeking actors to fill extra roles. Seeking actors for supporting and extras roles. Physically fit with real experience as military or weapons/tactical training. Films in May/June/July – various work dates. Looking for female actors to work as stand-ins in the new ‘Captain America 3′ movie. Will portray as senators, congressmen & congress women. Shooting June 14-July 4, 2015.